The girls have been dying to ask their friends for their very first BIG sleepover so I decided to use David Tutera's new Core’dinations David Tutera paper crafts line to make the invitations. Look for it in JoAnn's Stores coming soon! What's so great about this new line is that it's makes card crafting so easy for those who don't do it and need some hand holding (like me). Plus, the even though the girls are young they can help in the process of deciding what to add. It's basically a 1-2-3 system to take out most of the guesswork and overwhelming feeling of making your own homemade cards. First you have your basic cards and envelopes. Then you add layers to the front with various inlays and patterns. Finally you finish the pieces with embellishments which add your own personal touch. Here's how easy it was for us! 1. We chose a nice brown paper envelope and base card. 2. We chose pretty, girly, lattice overlays. 3. (This was the girl's favorite part) We embellished! And seriously the best part was that the girls did the majority of the choosing and work AND the cards look store bought! 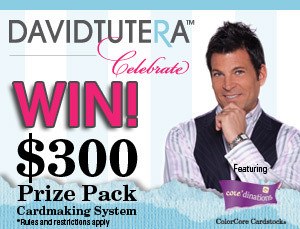 Three lucky winners will receive a $300 grand prize pack of supplies from David Tutera’s Celebrate cardmaking line AND a personally signed book from David! 20 additional winners will receive a $50 Celebrate prize pack. Sign up here for a chance to win: http://pages.exacttarget.com/tutera-optin-blog/.